While there may be some minor regional differences in the type or cut of suit that Santa Claus wears, here in the United States, he is typically garbed in a white fur trimmed red jacket and pants with a broad buckled belt, a matching hat and black boots. Garb him any other way and he wouldn’t be the Santa we all know and love, would he? Historically speaking, the first appearance of the Santa Claus we now recognize today, complete with a prototype Santa suit, was in the drawings by Thomas Nast, a popular editorial cartoonist who was associated with the widely circulated Harper’s Weekly which was quite influential during the late 1800s to early 1900s. Nast, today acclaimed as the “Father of the American Cartoon,” was the first to draw Santa wearing a red suit with fur lining, night cap and a black belt with a large buckle. 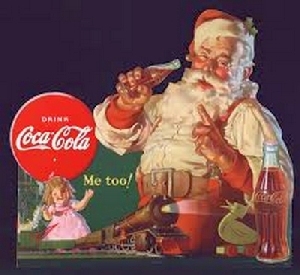 The modern image of Santa in a red suit with white trimmings though should be credited to artist Haddon Sundblom in connection with his advertising work during the 1930s for the Coca-Cola Company, which not by coincidence also carries the red and white corporate colors. So effective were Sundblum’s portraiture and imagery (and Coke’s zealous ad campaign) that to this day we can no longer think of Santa dressed or looking any other way. Sundblom’s Santa debuted in 1931 in Coke commercials in The Saturday Evening Post and appeared regularly in that magazine, as well as in Ladies Home Journal, National Geographic, The New Yorker and others. From 1931 to 1964, Sundblum painted Coca-Cola ads showing Santa delivering toys, pausing to read a letter and enjoy a Coke, visiting with the children who stayed up to greet him, and raiding the refrigerators at a number of homes. Sundblom did his final version of Santa Claus in 1964. 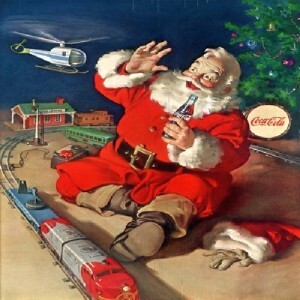 For several decades, Coca-Cola advertising featured images of Santa based on Sundblom’s original works. These original oil paintings were adapted for Coca-Cola advertising not only in magazines but also on store displays, billboards, posters, calendars and plush dolls. Now, many of these items are highly prized collectibles. Now, a bit of trivia about the Coke Santa. Did you know that in most of his work, Sundblum used himself as model for his Santa? 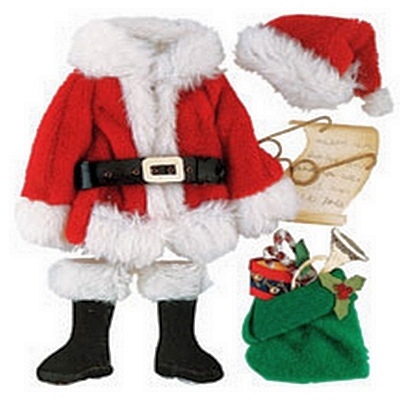 In fact, there is this collectible of a Santa with his belt buckle in reverse. This may be because Sundblum was using a mirror to paint himself. He also used children and a dog from his own neighborhood as models in some of his paintings.